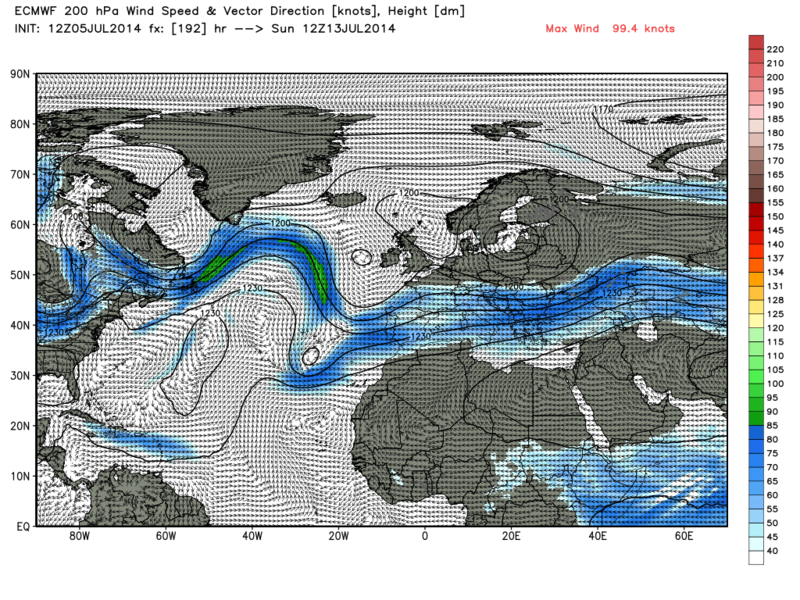 Low pressure over the South of the UK with a sharp trough aligned through the UK. Reliable time-frame, there and there abouts. Right? 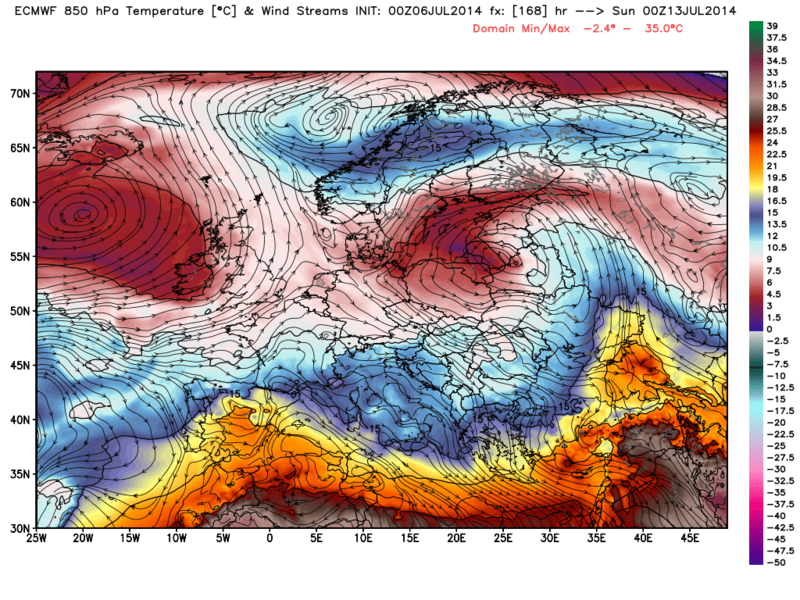 Trough much weaker with a low developing over central Europe. That's a big change for a model which should be rock solid at that time. Near identical. As much as the GFS is bashed, you have to admire the resolute consistency here whilst other models have struggled. Very strange to see this though I must admit. The roles are usually reversed. Most models apart from GFS supporting trough dominance as we move through next week. The azores high looks like it is going to struggle to ridge sufficiently NE thanks to active trough action to our NW, and with strong heights locked in place to the NE, the trough has nowhere to go other than settle itself over the country before moving towards Germany. The main player is the strength of the jet - it is firing into gear at the moment. A weaker jet would enable the azores high to build NE and quite possibly link with heights to the NE - with all the promise this would spell for heat lovers..
Alas, we are in a very different position to this time last year, when the jet was sent packing way to the north and we saw the azores high build NE ushering in a spell of wonderful summer weather. I have said before, this is a pivotal point in the summer, the way the jet behaves now often prevails in similar state throughout the rest of the summer, it traditionally stirs now after its spring slumber. 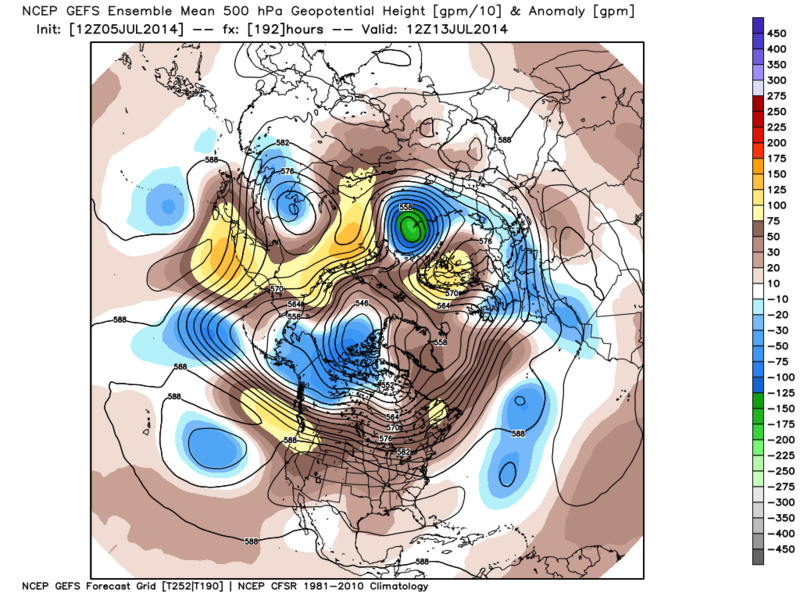 There is a change of emphasis with the 500mb anomalies this evening apart from the GFS for next weekend. NOAA has moved the trough slightly west although still affecting the UK The ECM is similar but the GFS isn't so keen to shift it from the UK. So rather than a NE/SW warm air linkage there is a NW/SE cooler air linkage with the cooler air over Europe.The Azores high taking a back seat to the west forcing the jet to curve around into a southerly route into n. Europe. With the ECM ens this leads to a large slack low pressure area in the eastern Atlantic stretching into Europe with the N and NE coming under the influence from the warm air to the NE leading, for a change, to the warmer temps being in those regions. 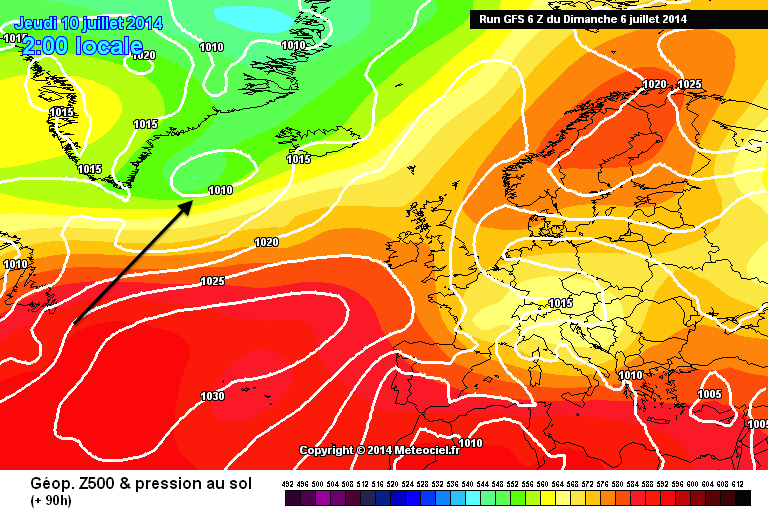 Which is good because the latter stages of the ECM 12z mean show the heat building and pressure rising from the south. Marked change in the GFS 500Mb anomaly from 12z yesterday for next weekend. The trough is now in a similar position to the NOAA and ECM having moved west to mid Atlantic resulting in a similar surface synopsis of a large slack area of low pressure over the eastern Atlantic and n. Europe. Temps in the UK should be slightly above average. Was just thinking how the influx of warmer uppers from the east sets up an above av temp spell from next weekend ( though not nec settled) and the ecm op doesnt even get the warm front past the east coast! Btw, all the ops are pretty poor at the moment. None deserve any special credit although gfs' persistence in pushing the high heights ne from the azores across the uk does seem to be odd. 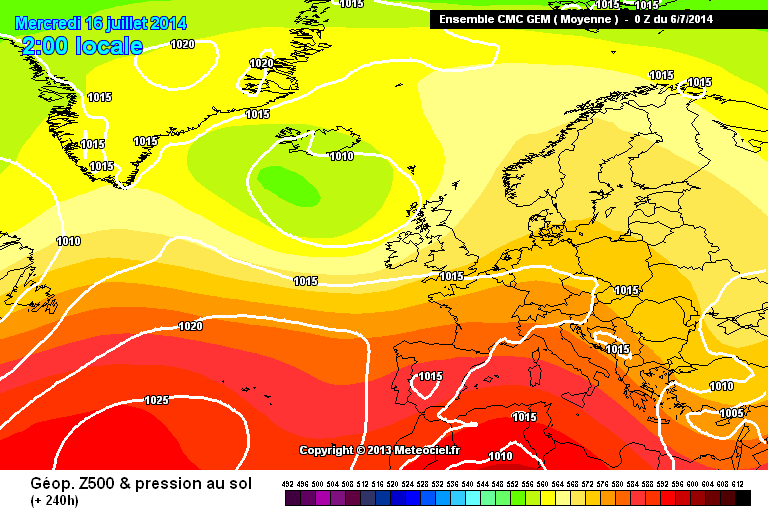 Ecm has picked the energy coming in from the nw although it hasnt managed to work out the resulting pattern. I guess a cut off upper trough causes headaches! Was just thinking how the influx of warmer uppers from the east sets up an above av temp spell from next weekend ( though not nec settled) and the ecm op doesnt even get the warm front past the east coast!Btw, all the ops are pretty poor at the moment. None deserve any special credit although gfs' persistence in pushing the high heights ne from the azores across the uk does seem to be odd. 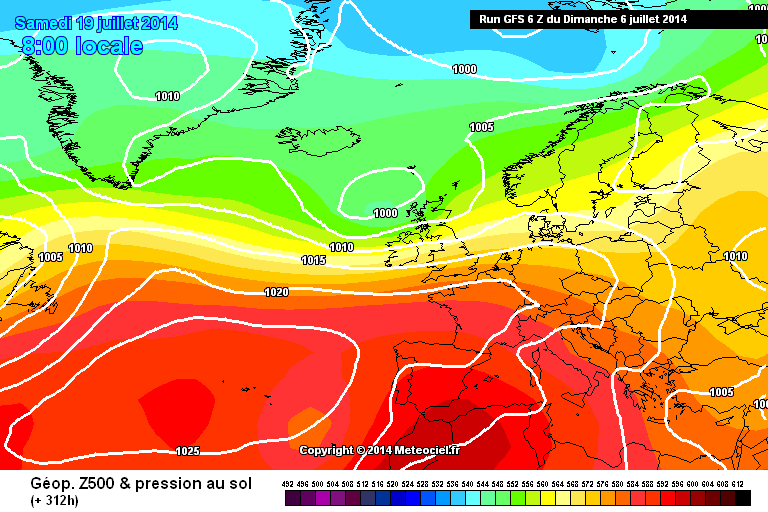 Ecm has picked the energy coming in from the nw although it hasnt managed to work out the resulting pattern. I guess a cut off upper trough causes headaches! Yes a bit of a bummer that. 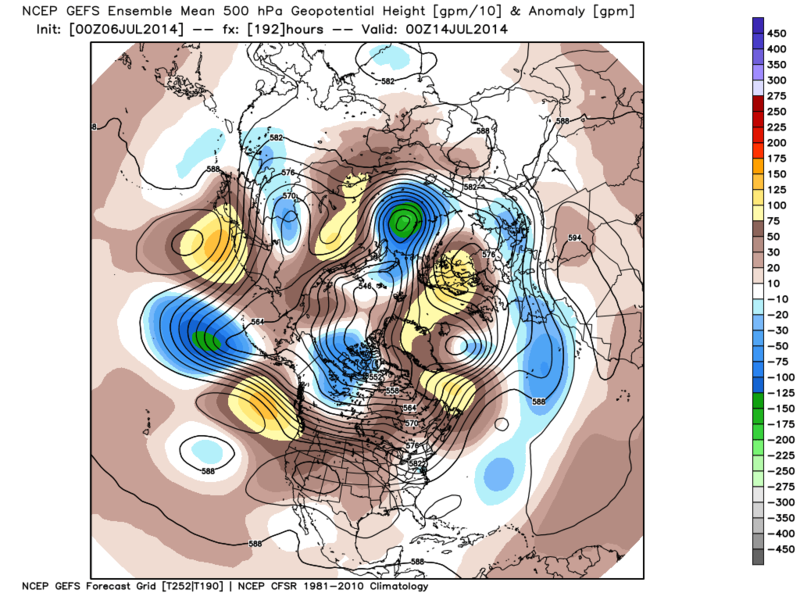 Latter stages of the ECM ens show the chances of the Atlantic trough/downstream euro ridge scenario to be increasing. 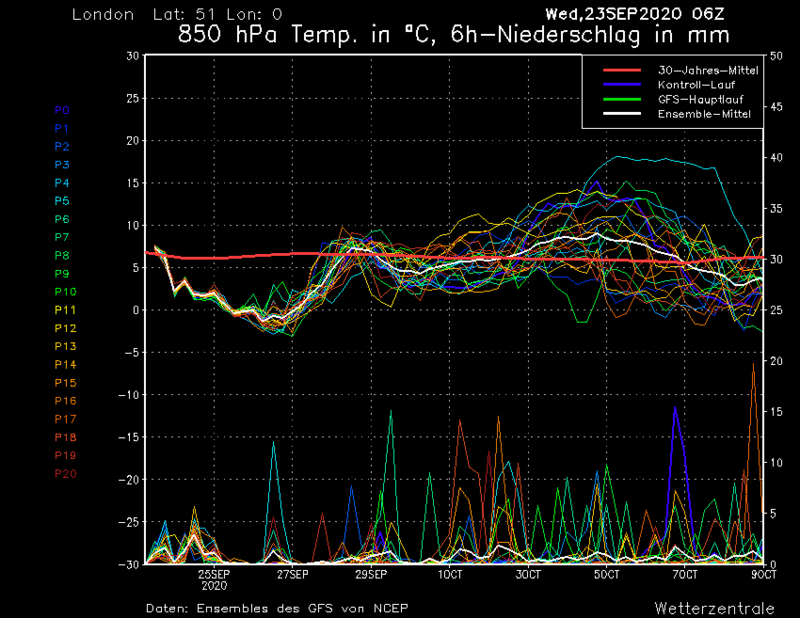 That may explain the higher london temps on the graph by mid month. What has so far been a decent summer may be about to take a turn for the even better. ?? 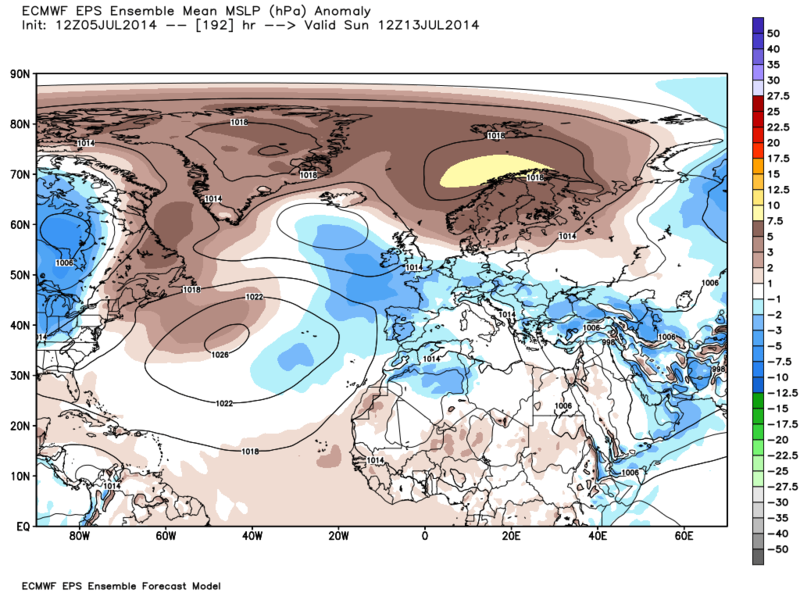 The route to something very warm or even hot is starting to appear around the week 2 range. The low which crosses the Atlantic at the end of the coming week is stalling around the Iceland region, Its presence eventually allows troughing to develop in the Atlantic as it phases with a new low coming off the Newfoundland coast. This causes a new upper ridge to build over Iberia which will allow heat to push up from the south. We need the low over Iceland to phase with the system upstream to allow a ridge to develop. Of course we could easily see the energy there drain south eastwards keeping the fairly warm but mixed conditions over the UK. 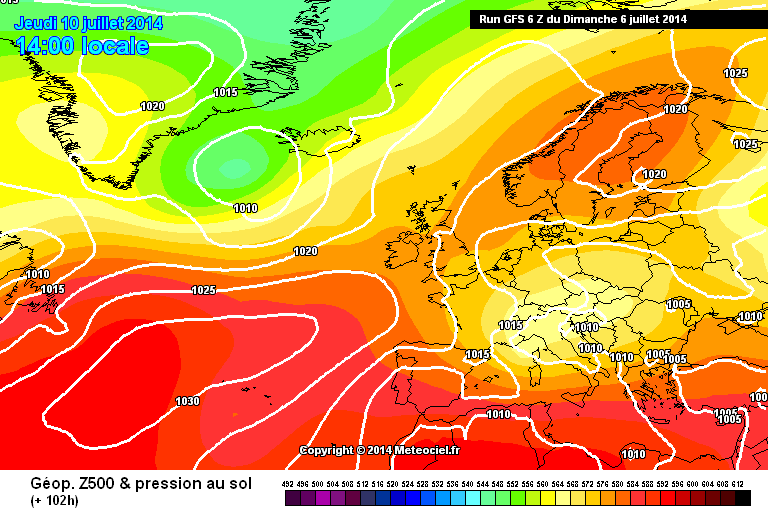 GFS 6z has all the building blocks in place for a potential hot spell. Low pressure stalling over iceland, blocking high over Scandinavia and a the Azores high pushing up from the south west. Game on! 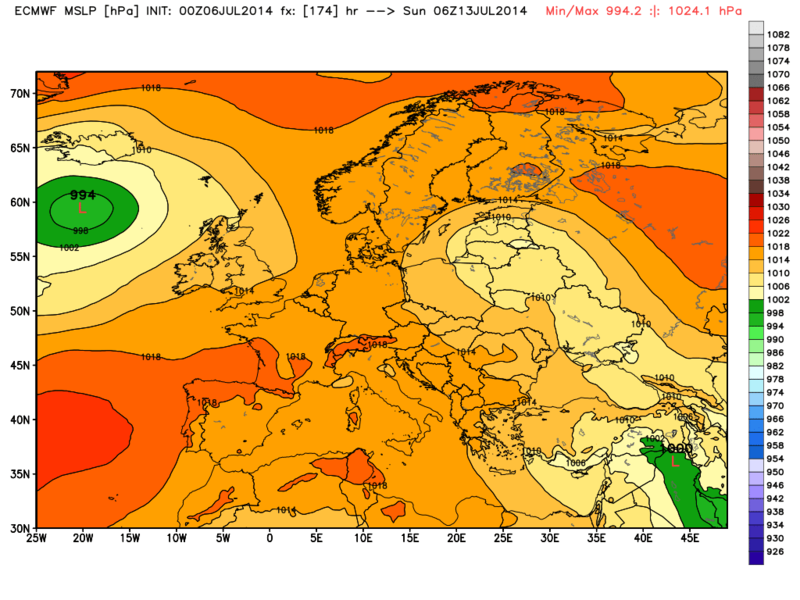 looking at the extended ecm ens, it appears that a nw europe mid month plume is on the agenda. too early to have a strong opinion on its longevity or how likely it is to get as far north as here although this atlantic troughing is not a new idea. The Polar Vortex certainly seems to be tightening up at last towards the end of the run, With High Latitude blocking fading away. Something that has been prominent during Spring and the start of Summer so far.. Even if there is a ridge it is a brief affair. So despite the postings suggesting this is resolved I am not sure. Looking at the 5 day ECM postage stamps it is apparent that they are also split. 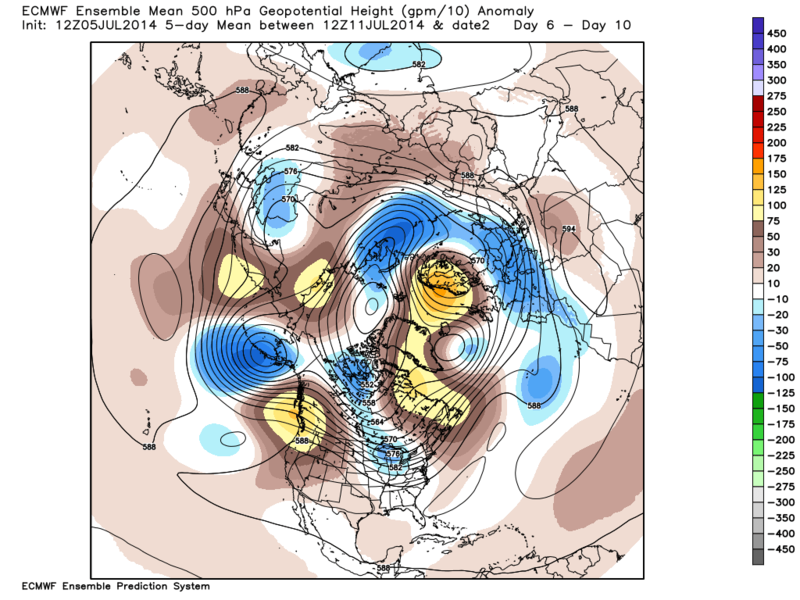 The op and control are not in the main cluster and many show a stronger mid-week ridge. If ECM is wrong with either the intensity of the Iceland low or the ridging mid-week then it's latter FI attempts to build the Euro ridge may be unfounded, and of course the whole suit will be skewed as the op has good support from its members. 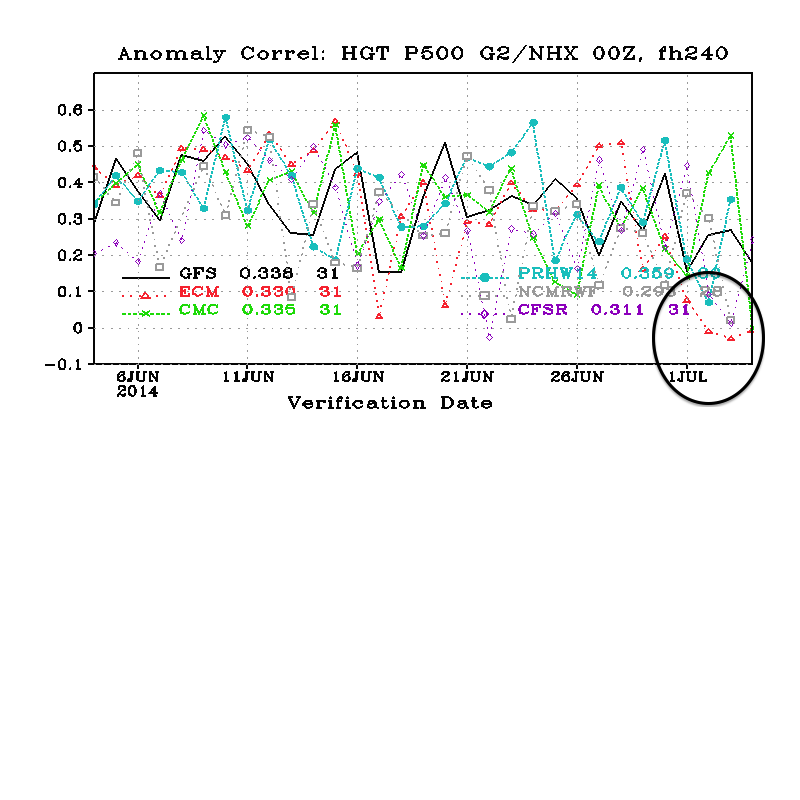 I can see why the models are performing poorly, lots of uncertainty. The ECM ensembles have been quite consistent with this trend towards day 10 and the op gets there too, though the op seems a bit different compared to other models for this week. Would this supposed bias always lead to higher pressure predicted over the UK than occurs? what's to say it wouldn't lead to the ECM overdoing high latitude blocking which forces lows further south towards the UK? As you say there seems to be a fair amount of uncertainty around, and perhaps slack pressure patterns. 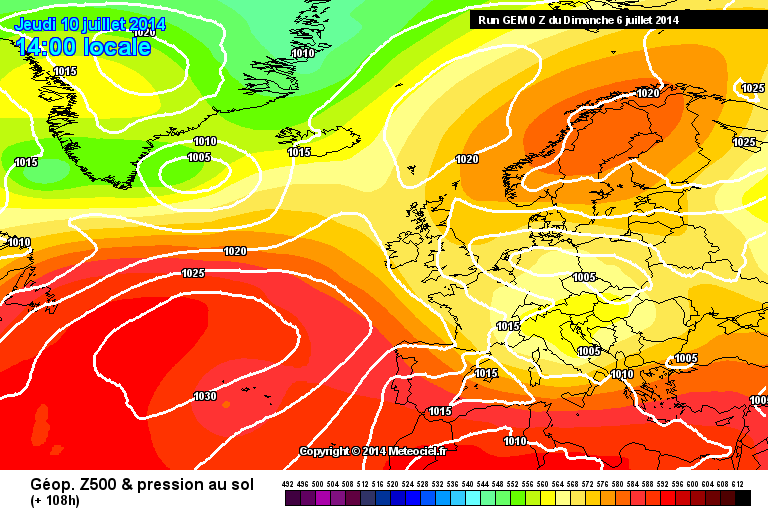 Probably because the ECM was repeatedly going for Scandi trough for the week just gone, the flatter solution verified as the south east experienced with conditions turning very warm for a couple of day. Hence also why the GFS is faring a little better. The ECM solution for week 2 makes sense, if the low stalls over Iceland you would expect a trough in that vicinity to develop in due course which would correlate to a Euro ridge developing with the potential to affect the UK as well. Mmm reliable timeframe is quite short at the moment. Models are struggling, we are only now seeing them latch onto a strong trough development to our east come mid week ushering a possibly very wet cool day in the east on Wednesday. It is a tricky set up to predict with the UK in a bit of a no-mans land at the moment almost 'col' situation, with strong heights to the SW and NE and low heights to the NW and SE. 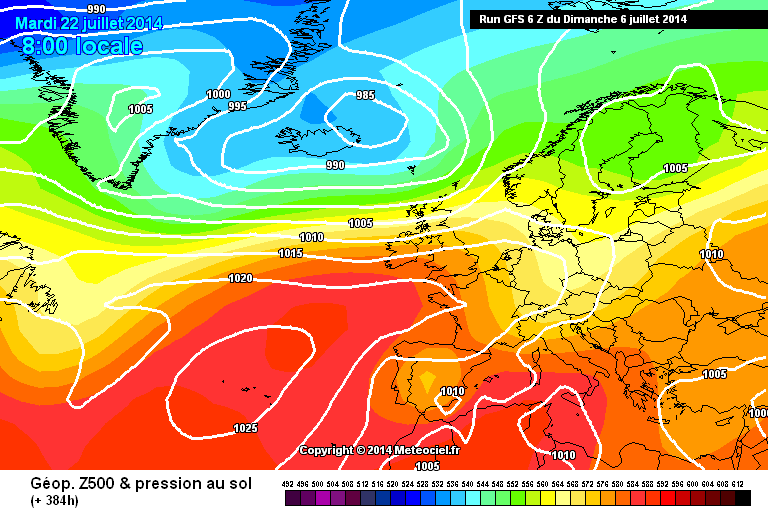 Expect the models to continue to play around with developments as we move into the middle part of July and what traditionally marks the start of 'high summer'. 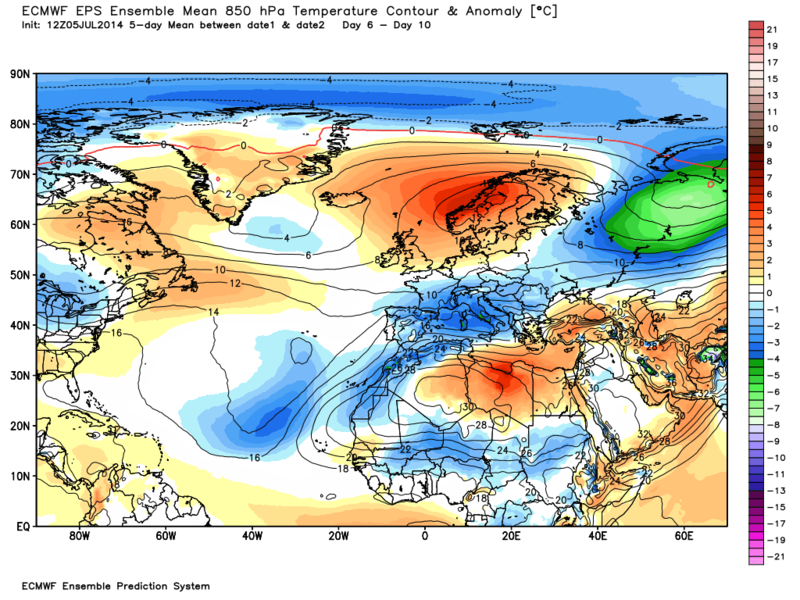 There are tentative signs though we could see a strong trough developing over east atlantic thanks to a stronger core of low heights within the polar vortex, this would have the effect of allowing a strong ridge to develop over Spain/France and with both the azores high and scandi high in place - it could set up the first proper very warm spell of the summer.. but this is some way off and developments next week could easily scupper such an evolution. The large scale pattern, which has been very cyclical in nature persists at least for the timebeing. 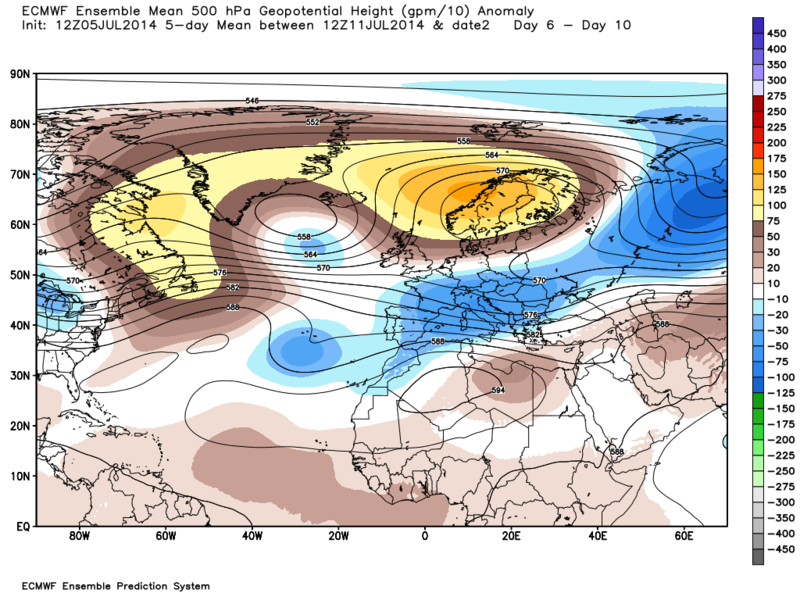 We have been seeing, and continue to see fascinating permutations of the atlantic high and downstream trough larger scale atlantic, UK and European pattern. In terms of what this means for the UK - well, upstream jet patterns are determining whether individual lows get cut off, stall, and then allow a further downstream ridge to develop or whether the jet stream is less sinuous (flatter) and simply phases with the previous trough ejected eastwards into Europe. The amplifying and de-amplifying of the retracted Azores High playing its part in determining how far south the downstream troughs dig towards/over the UK and whether renewed upstream jet pulses eject these phases of troughing eastwards quickly or not. In the short term we see todays cold front struggling to exit the SE with a maritime atlantic airstream behind it that is giving rise to the showery conditions of today and the next couple of days. 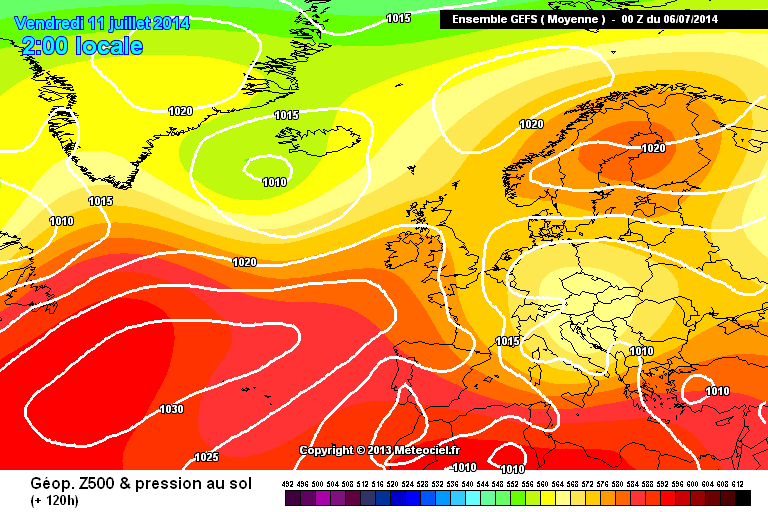 Meanwhile hot and humid conditions prevail and are set to continue to prevail as one heads not too far from the Low Countries into Germany and central europe as a whole. This heat successfully advected as far north into Scandinavia. It is the boundary of these two different airmasses which grinds to a halt towards central Europe and re-invigorates the troughing just to our east towards mid week and provides the rain risk to eastern most counties on the 'cool' side of the trough boundary. This boundary of airmasses in tandem with the upstream advancing jet pattern is what has been causing the model headaches in terms of how the continental heat low phases with upstream trough disruption - or, whether the upstream trough stays in disconnect as it slows to our NW.  So, with that in mind we return to the solution options mentioned higher up this post. The models continue to try to calculate which of these solutions will determine the further outlook. The odds currently, as correctly observed by a few members this morning are edging towards the cut-off scenario whereby the trough to our east can escape away from its mid week influence over eastern UK and the next one can approach from the NW and take advantage of a pause in the jetstream and slow down - which subsequenrly enables sub tropical ridging to head somehat north and bring some of the southern and central european heat the way of the UK. As bluearmy observes, the question is how far north, and for how long such a potential 'plume' may advect north. Any possible larger scale sea change to more settled conditions mentioned in the previous post update remains rather a mute question. The toying of the models with the possible split in the jet stream and a little more energy heading north with energy transport towards the pole, does give sub tropical mid latitude ridging more room to escape from the shackles of the more amplified western displaced High pressure anomaly - and thus displace low pressure further north west. However, it remains questionable how long the background cyclical signal will allow this beyond another eastward moving ridge scenario that might follow after midmonth and bring heat northwards before shunting it eastwards again. 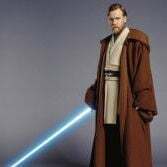 So despite such hints of something quite a lot warmer, we may be looking simply at the prospect of a 'southerly toppler'. 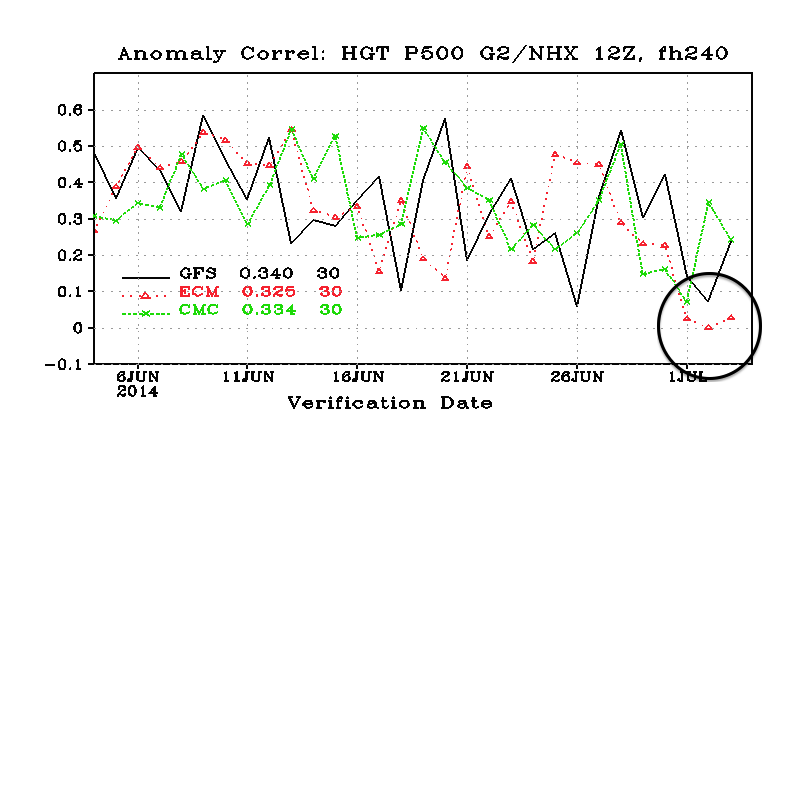 There still remains something of a disconnect between atmospheric and oceanic signals (latter El Nino) that determines any movement towards anything more sustained in terms of classic summer weather. But with changing wavelengths as we approach the heart of the middle of the summer it does pose questions as to how the atmosphere is going to respond in the few weeks ahead and whether a classic summer pattern can evolve to follow a (possible) thundery breakdown of any mid month toppling plume - or whether the s.q re-asserts itself. Low resolution but its about the time you see the -10 isotherm reappear.